Now is the time to focus on and begin pushing solutions to address the Highway Trust Fund’s (HTF) permanent revenue deficit, not when the current surface transportation law expires in less than five years, Sen. Jim Inhofe (R-Okla.), pictured, told more than 125 guests at the June 29 Interstate Highway System 60th Anniversary event sponsored by ARTBA and the American Trucking Associations. 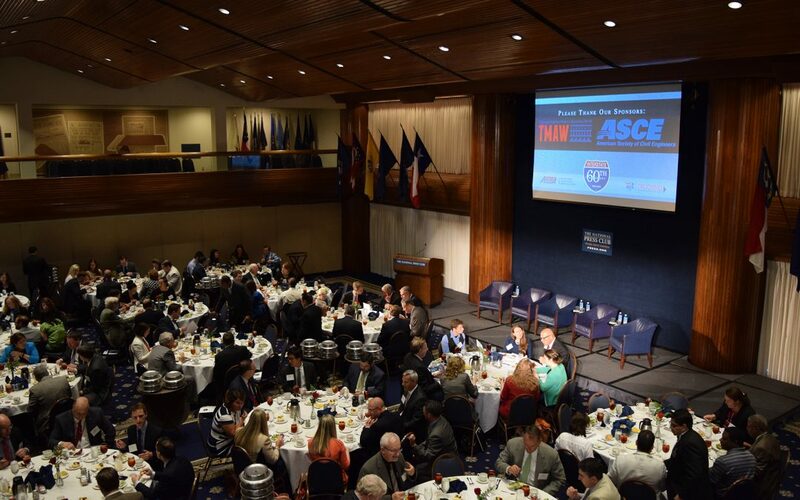 It was held at the National Press Club in Washington, D.C., and is a key initiative of the this year’s “Transportation Makes America Work” program. “You can’t sit around and do nothing until 2020,” said Inhofe, chairman of the Environment & Public Works Committee. He urged transportation infrastructure investment advocates to use coalitions and push members of Congress for legislation to bridge the expected $18 billion average annual HTF gap beginning in 2020. He said there are “great opportunities” for international and domestic tax reform as part of the solution. He also expressed continued support for the user fee concept. Inhofe, a bedrock conservative himself, said that a small group of conservatives in the Senate and House cause more problems when it comes to paying for expanded transportation investments, while liberals keep construction bogged down with too many regulations. Jim Pinkerton, a Fox News contributor, outlined the thesis of his 2015 book “A Vision of American Strength: How U.S. Transportation Infrastructure Built the United States.” He told the audience that “infrastructure is vision,” which creates unity and progress for the nation. “What better way to consecrate the diamond anniversary of the Interstates than to start all over again” with renewed commitment to investment, Pinkerton said. John Lex, professional driver, Walmart Transportation. There was consensus from the panelists about the need for major new investments in the Interstates and other transportation modes, and to improve highway safety. All said increasing the federal gas tax was the best way to generate the necessary revenue quickly. They also acknowledged that tolling, including vehicle miles traveled charges, and public-private partnerships, are also part of the conversation. The Interstates are facing a $90 billion backlog just to maintain the current 47,000-mile network, Paniati said. He brushed aside suggestions that the system doesn’t need more investment because it’s built out. That’s as ridiculous as saying you don’t have to put money into a house after the initial purchase, he said. Watch the video of Sen. Inhofe’s speech and the panel discussion. Pictured above, left to right: Fox News contributor Jim Pinkerton, Institute of Transportation Engineers CEO Jeff Paniati, Myrtle Beach Chamber of Commerce President Brad Dean, American Trucking Association President Bill Graves, UPS Senior Vice President Pat Thomas, ARTBA President Pete Ruane, Walmart Professional Truck Driver John Lex, ARTBA Chairman & Zachry Construction CEO David Zachry, and American Society of Civil Engineers Government Relations & Infrastructure Initiatives Managing Director Brian Pallasch.